The Bosch S 111 1K Sabre Saw Blades are made from Bi-Metal with a side set, milled toothing design. 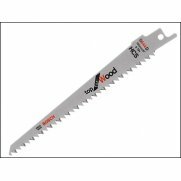 All-purpose blade designed for durability in heavy use and multiple materials. Thicker blade body for stability and straight cuts. Durable tip protects teeth and helps prevent blade damage. Suitable for use with: Wood with Nails/Metal, Chipboard: <175mm; Plastic Profiles: Diameter: <175mm; Plastics, Fibreglass, Reinforced Plastic, Solid: <50mm.